In his 1980 opening editorial, Classroom Computer News Editor, Lloyd R. Prentice, wrote: “Indeed, science fiction writer Arthur C. Clarke sees education and small computers coming together like two hemispheres of plutonium in a nuclear device, leading to an explosion of educational and social progress. But others are not so sure—they point to teaching machines and instructional television. They say the shiny computer of today will attract dust in the closet tomorrow.” Below, we revisit this 1980 issue’s reporting about some of these shiny new things for your reading pleasure. Apple II■ Apple Computer: Apple primarily produces a microcomputer, the Apple II (a new Apple will soon be introduced), for classroom use. 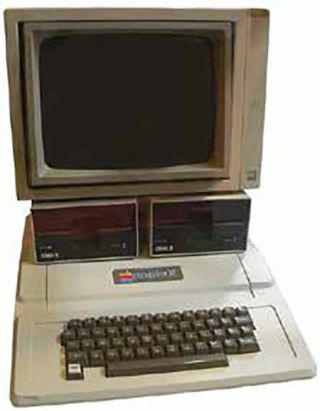 While Apple does provide many applications programs for special functions with the computer, independent software houses produce most of the software for the Apple II. importance of the educational computer market. It has entered into an agreement whereby Science Research Associates (SRA) will develop educational software for the Atari 800 and 400. ■ Digital: The PDP-11, PDP-8 and VAX systems are the three Digital computers most employed in education. Digital sells applications software for its systems but also has a special education group which provides support to educators. Commodore PET■ Commodore Business Machines: Commodore’s primary contribution to the educational computing market is the Commodore PET microcomputer. Much educational software is available for the PET. ■ Control Data Corporation: Control Data developed PLATO, a computer-based education network consisting of both hardware and software, in 1967. The programs range from basic skills to business and accounting courses. ■ Honeywell: Honeywell software includes both a student scheduling system called SCRIBE and a time-share library for educators called EDINET, which includes tutorial, drill, and simulation learning activities for children. Honeywell personnel are also working on a version of the LOGO language for the Honeywell microcomputer. ■ IBM: IBM has many general computer systems used in schools. The 4300 and 8100 mainframes are two examples. The software for these systems include a student record-keeping program called EPIC and an instructional system called Interactive Instructional Systems (IIS). ■ Radio Shack: Officials at Radio Shack insist that they don’t want Radio Shack identified only as a “hardware peddler.” Using both in-house people and educators, using the Radio Shack microcomputer, Radio Shack has been developing software for its TRS-80 microcomputer. Texas Instruments Speak & Spell■ Texas Instruments: Texas Instruments’ major contributions to the educational market are a series of microprocessor-based learning aids such as Speak ‘n Spell, Speak ‘n Read, Speak ‘n Math, and a personal computer, the Texas Instruments 99/4.